Why are people happy the year ended? I am trying to empathize with the people of this small planet called Earth. What makes today different from yesterday, I can only speak for me, but here are my feelings. I am searching for the “Fountain of Youth,” today is the day we start. 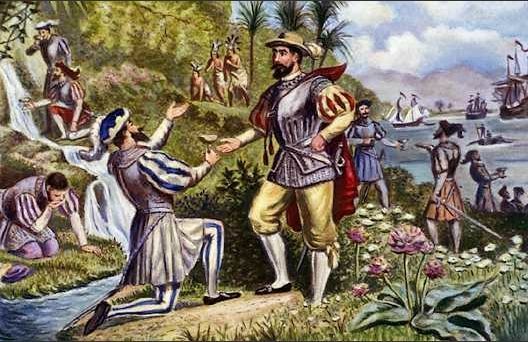 Spanish explorer Juan Ponce de León thought it might be on the Island of Bimini. What do you do after we have enough food, water, sleep? What do we do after we know you can be love by me, and I can be loved by you? What do I do, when I know I am the Master of my fate, the leaders of my free world? Travel, that is easy. Travel is the desire to find the Fountain of Youth, knowing we must never find it, because if we did, all our excuses for running away from home would end. I am not sure; I think I am looking for a good book, a good story: I read a good book the other day; I am wondering if this electronic e-book reader called, a Kindle by Amazon.com is the answer to our traveler’s prayers. God allow me to have one good book in my backpack, and make it come to past, that on the day I finish the book, I accidentally find the next good book. I beg you father, please, oh please, I beg of you, do not force me to read a book I do not like, grant my first prayer so this will never happen. Please make an exception to policy, I want to pray to read my desire, not what you feel I need to read. PS, send extra batteries, I need to be able to read for 10 days without electricity. I would tell you a number, but since you are all knowing, you do the math. Truly, I do not think I want a Kindle, it feels a little too big to me. Verizon first gave me a BlackBerry to review, I download a program called Mobi Pocket, it is free, the perfect prices for a traveler. I now have the HTC Touch Pro II to review, I downloaded the MobiPocket.com for Windows Mobile, then proceeded to download on the free book site called Gutenberg.org. I download David Copperfield, by Charles Dickens, and I am now reading this, as best I figure out, you can use MobiPocket.com on many Cell Phones. I buy many books, I pay on average one Dollars U.S. per book, they are all used. I will sign them, and leave them in Hotel room all over the planet, I am marking my territory. I am wondering, can a person buy an e-book,then share. This sounds better than paying 10-20 dollar. I use the E-book reader called Mobi Pocket, then if this if is possible, please send recommended books to me. I have not told you, but you can also just hit reply if you are reading this in your email box. I went astray on this book thing, or did we, I am searching for the Fountain of Youth, and I think it is an idea, a dream, something we see in our minds. It is a good story, until it ends, it is a story shared. Two travelers meet along the path, they say go this way; the path is good, somewhat like sharing a good book. The Fountain of Youth, is having the time to muse, to search for the what-ifs of life. When will I stop traveling, when I know why I travel, I truly do not know.